The first quarter of the Super Bowl wasn't even over yet, and Esurance already appeared to be miles ahead of competitors when it comes to social chatter. The insurance brand ran a 30-second pregame ad created by Leo Burnett. 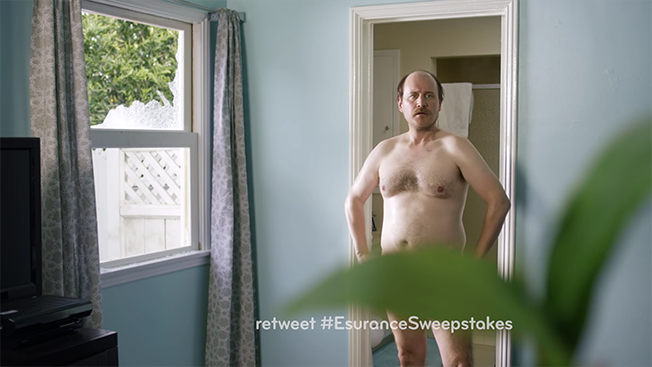 The commercial promotes a contest in which people could win up to $1 million in exchange for tweeting #Esurancesweepstakes. According to data from tech company Spredfast, the brand's Twitter mentions spiked at 6:35 p.m. when the commercial aired, generating 9,000 tweets per minute. The hashtag also trended nationally on Twitter for roughly 15 minutes. Esurance ranked No. 1 on Spredfast's first-quarter Super Bowl data for Twitter with 375,000 tweets, behind only Doritos' 172,000 tweets. By comparison, Mountain Dew was third in Spredfast's stats, pulling in roughly 53,000 tweets. Building social buzz around the Super Bowl without buying an in-game spot has become somewhat of a go-to move for Esurance. The brand ran a similar campaign in 2014 after the Super Bowl, giving out $1.5 million. If I won the #EsuranceSweepstakes I would rescue Scott Baio from space jail.